The rapid-scan radar will scan continuously from the bottom to the top changing between LOWresTALL and HIGHresLOW. Purpose Lower resolution 3-dimensional volume scans will allow to monitor the flow towards the mountains. Lower resolution, tall volume scans will be accomplished when precipitation occurs within 30 km range of the radar. Six elevations will be scanned in 7.5 s, i.e., the entire volume consisting of 10 scans (360deg) will be scanned every 75 s from the bottom to the top. Maximum range and spatial resolution Ten suits of six elevations will be scanned ranging from 0.5deg - 59.5deg. The distance between the mountains and the radar is about 4-5 km. With the LOWresTALL scans we will reach up to a height of 6 km MSL at a range of 5 km. A pulse length of 100m is chosen in order to achieve a maximum range of 30 km (100 m x 300 pulses = 30 km). 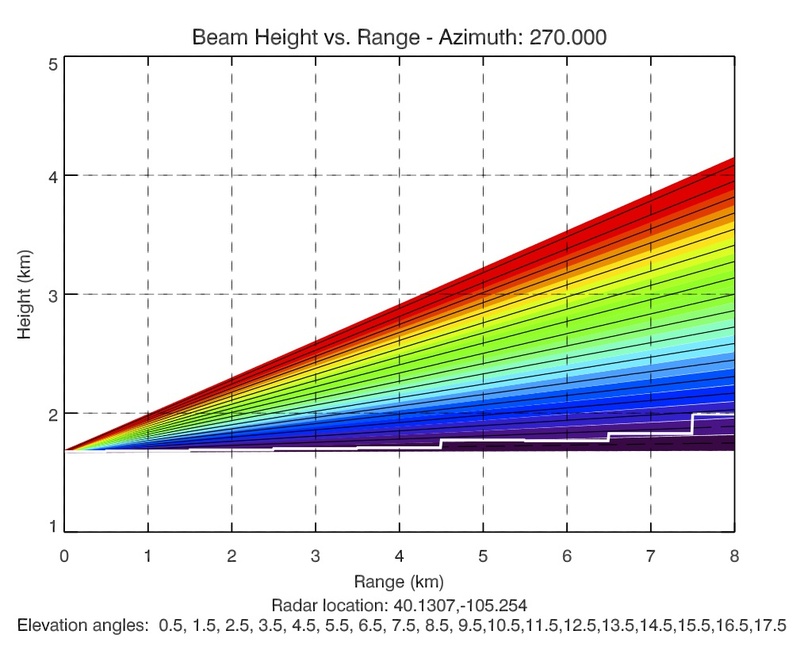 Beam Height vs. Range Image: Show the height of the individual elevation angles ranging from 0.5-59.5deg (each beam is color coded) up to a range of 35 km. The beamwidth is 0.9deg, i.e., 0.5deg elevation angle (black solid lines) ranges from 0.05-1.4deg. The white solid line indicates topography height at 270deg azimuth angle (towards the west). Black, dashed lines indicate that the radar beam is partially (min 50%) or completely blocked by the mountains. The radar location is the Eldorado site south of Boulder. Click image to enlarge. Purpose High resolution 3-dimensional volume scans will allow to monitor the interaction between the flow and the mountains. High resolution scans close the surface will be accomplished when precipitation reaches the Front Range. Maximum range and spatial resolution Three suits of six elevations will be scanned ranging from 0.5deg - 17.5deg. The distance between the mountains and the radar is about 4-5 km. With the HIGHresLOW scans we will reach up to a height of 3.25 km MSL at a range of 5 km. A pulse length of 25 m is chosen in order to achieve a maximum range of 7.5 km (25 m x 300 pulses = 7.5 km). 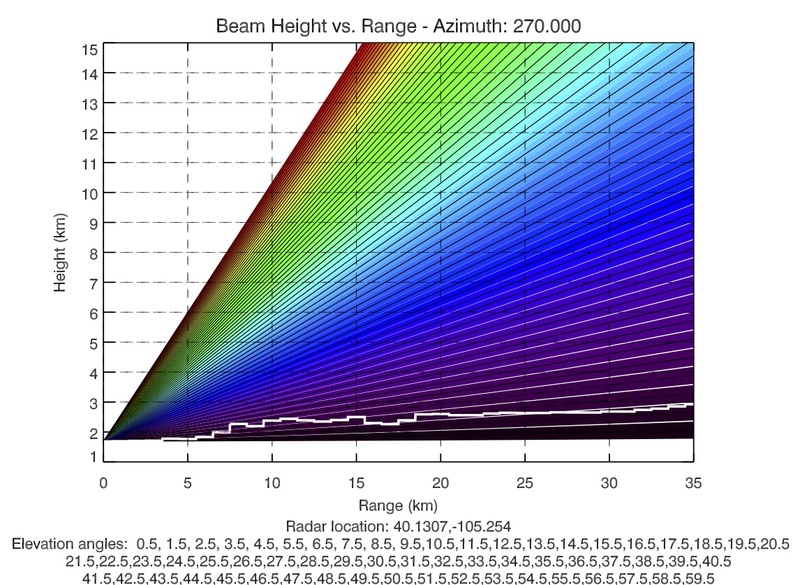 Beam Height vs. Range Image: Show the height of the individual elevation angles ranging from 0.5-17.5deg (each beam is color coded) up to a range of 8 km. The beamwidth is 0.9deg, i.e., 0.5deg elevation angle (black solid lines) ranges from 0.05-1.4deg. The white solid line indicates topography height. Black, dashed lines indicate that the radar beam is partially (min 50%) or completely blocked by the mountains. The radar location is the Eldorado site south of Boulder. Click image to enlarge.